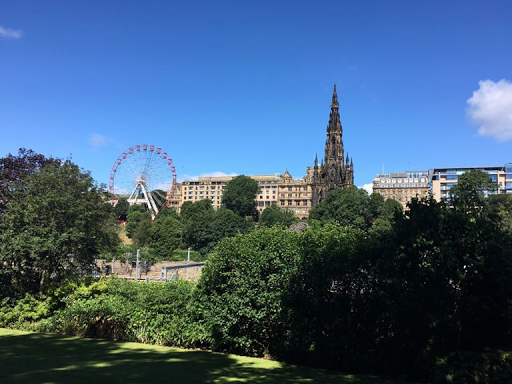 As part of a birthday present, I took my boyfriend to Edinburgh for the weekend and also booked it so that we would also be away for our 1 year anniversary. (Awh so cute…) Edinburgh is about a two hour journey on the train from where I live and it’s such a beautiful city so I chose to go there for two nights/three days. I’m going to share what we did during the few days we had since I have lacked to update on my life the past few months – so you’re getting it all at once! We stayed at a premier inn hub, and it was reasonably priced and so lovely. The rooms were built to be modernised and compact and to use the space as efficiently as possible and it was pretty cool. I’d definitely recommend it if you’ve got one near you. I want to say this is Princes gardens… Correct me if I’m wrong! Either way, it was beautiful and really nice weather to walk through. Although the weather can’t be very reliable, and we had all weathers in the short time we were there. This was a good weather day! On our first day we went to Camera Obscura which is an illusion place with many floors of various optical illusions. If you ever find yourself in Edinburgh, don’t miss it! We tried to go at an off peak time so went right early but it takes a couple hours at max to get through so it does gradually get busier. Price wise, I think it was around £16 for us as students but maybe £20 as adults. Children were much lower. There’s so much to see and be amused by. There’s also a 15 minute show at the top where you actually can view from the real camera Obscura at the top of the building. 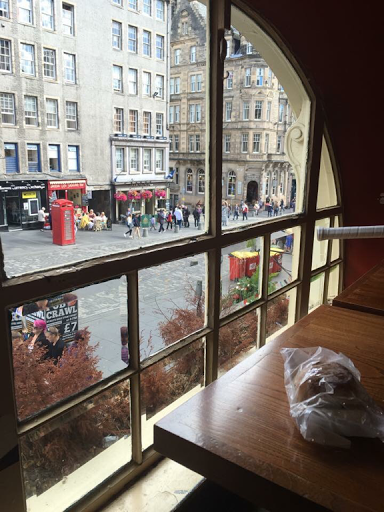 Our hotel was just off of the Royal mile so we always found ourself along there for breakfast/lunch. We did have the option to have breakfast in the hotel but we chose to eat out and explore different places. This being one of them – The Coffee House. It wasn’t anything special, just your average cafe but we went upstairs and snatched a window seat with this view. Oh – and the cappucinos are amazing! It was so nice to sit and people watch for an hour. 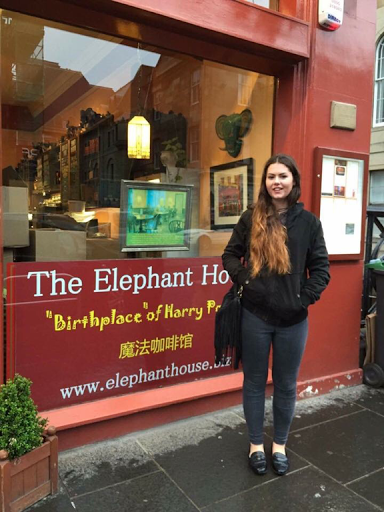 We couldn’t come to Edinburgh without visiting this one. 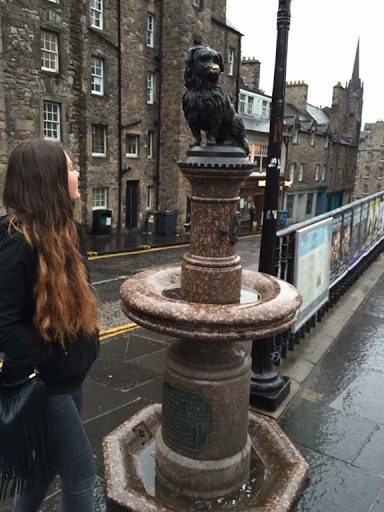 We went to Greyfriars Bobby’s grave and this monument. (I have long hair here aaaah!) This was a rainy night, but we still went out and explored. We went to this amazing family owned Italian, I’ll try and find the name of it but it had the best bruschetta I’ve ever tasted in my life – and I’ve had a lot. We strolled around the graveyard for a while, finding the graves and also had a look out for some of the names that inspired J.K Rowlings Harry Potter characters, but couldn’t find them as it was too big. It then started to darken a bit and we spooked ourself about getting locked inside so we left. I HAD to get a picture. So I did and I wasn’t ashamed. The Italian we want to was directly across from here and I spotted it as we were eating when a group of tourists stopped and got photos outside it. I never even realised where it was before. I was very chuffed. 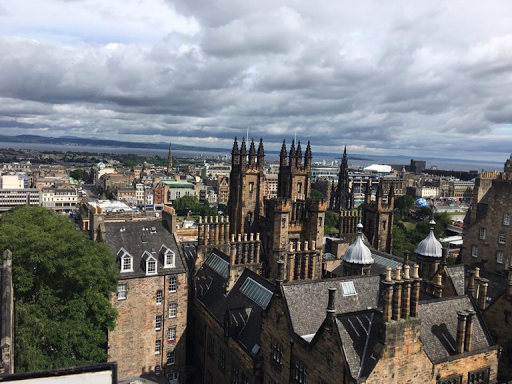 I’ll definitely be returning back to Edinburgh again – not that it’s far away or anything but I just don’t often visit! I would hopefully like to study at university in Edinburgh or Aberdeen so I’ll have to see what happens. If anyone can help me with the name of the Italian across from here, then please be of assistance. And if you happen to find yourself here, go eat there and order the bruschetta (and the cheesecake!!). Thanks for reading! Another blog post will be up in due time on more of my summer adventures!